Parts of Western Kansas are A winter storm is expected to impact the region today, bringing accumulating snowfall from late this afternoon through Tuesday afternoon. The most intense snowfall rates will occur from late this evening through Tuesday morning. Widespread snowfall accumulations of 6 to 10 inches are expected across much of the area, with locally higher amounts on the order of 12 inches or greater possible. The most likely area for the highest snowfall totals will be just south and east the Kansas City metro area, and southwestward into far eastern Kansas. 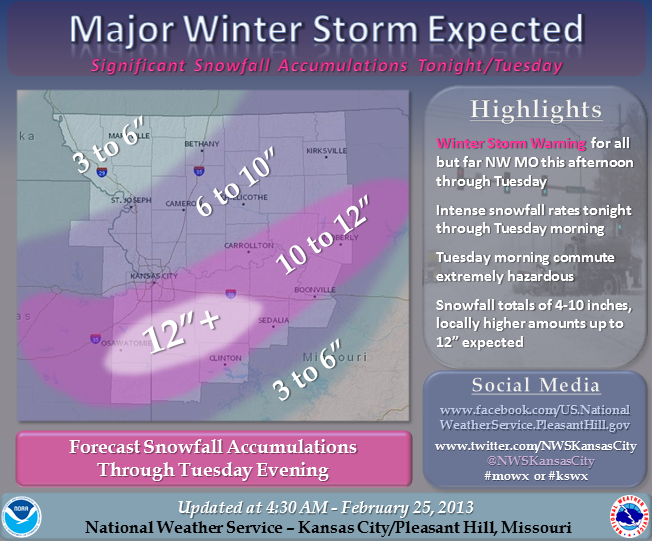 The National Weather Service in Pleasant Hill (Kansas City) says the storm is expected to bring accumulating snowfall from late this afternoon through Tuesday afternoon. The most intense snowfall rates will occur from late this evening through Tuesday morning. Widespread snowfall accumulations of 6 to 10 inches are expected across much of west and central Missouri, spreading throughout the northern half of the state. Rain is expected in the southern portion of Missouri. The Weather Service says locally higher amounts on the order of 12 inches or greater possible. The most likely area for the highest snowfall totals will be just south and east the Kansas City metro area, and southwestward into far eastern Kansas.